In the 1970s, New York City was plagued by crime, filth, and an ineffective government. The city was falling apart, and even the newly constructed World Trade Center threatened to be a fiasco. But in April 1976, a quarter-mile up on the 107th floor of the North Tower, a new restaurant called Windows on the World opened its doors—a glittering sign that New York wasn’t done just yet. In The Most Spectacular Restaurant in the World, journalist Tom Roston tells the complete history of this incredible restaurant, from its stunning $14-million opening to 9/11 and its tragic end. There are stories of the people behind it, such as Joe Baum, the celebrated restaurateur, who was said to be the only man who could outspend an unlimited budget; the well-tipped waiters; and the cavalcade of famous guests, as well as everyday people celebrating the key moments in their lives. Roston also charts the changes in American food, from baroque and theatrical to locally sourced and organic. Built on nearly 150 original interviews, The Most Spectacular Restaurant in the World is the story of New York City’s restaurant culture and the quintessential American drive to succeed. A journalist for over 20 years, Tom Roston worked at The Nation and Vanity Fair, and was a senior editor at Premiere for a decade. His work has appeared in the New York Times, New York Magazine, and more. Roston writes about documentary films for PBS.org. He lives in Brooklyn, New York. 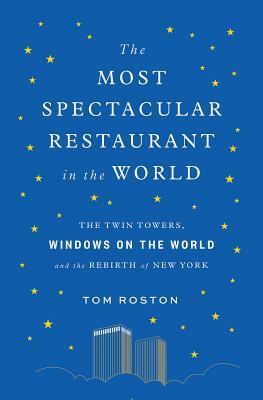 “Much more than a history of a restaurant spectacular for its views, Roston has woven together a riveting history of New York City since its near collapse in the 1970s and intriguing stories about the restaurant business. The terrible tragedy of 9/11 looms, but there is also a heartening theme of how even the worst architectural excrescence can be transformed by people and imagination. The World Trade Center was cold and ugly from its inception, but its restaurant was magical."